Our Kit for Kids program is designed to teach elementary and middle school students about their peers with autism. The kit is centered around an illustrated booklet entitled “What’s Up with Nick?”. This colorful, kid-friendly booklet tells the story about a new student, a boy with autism named Nick, through the eyes of a typical peer. The story teaches children that students with autism may think differently or need some accommodations, but all students are of equal worth and should be treated as such. You can use this program to increase awareness of autism among students from grades K-8. With greater knowledge of autism, our youth will learn to see the person first rather than focus on a classmate’s disability. By increasing students’ acceptance of differences, the Kit for Kids creates a more inclusive classroom and overall sense of community. Despite the growing number of children with autism educated in mainstream classrooms, many students are not familiar with autism. A University of Georgia study (Campbell & Barger, 2010) found that only 46% of middle school students surveyed had heard of autism. Despite some recognition of the disability, they had little knowledge of its characteristics, such as communication and social skill challenges. If students are uninformed about a disability, they often attribute undesirable social behaviors to individual choice. For example, a classmate may interpret avoidance of eye contact as rude instead of as a behavioral characteristic of autism. Negative behaviors stem from this lack of understanding. A 2012 study by the Kennedy Krieger Institute found that 63% of children with autism surveyed had been bullied, compared to only 12% of these same children’s typically-developing siblings. The combination of more autism diagnoses, more children with autism accessing general education, and an explosion of bullying is creating a perfect storm in America’s classrooms. OAR’s Kit for Kids helps address these problems; educating children about autism will foster a greater understanding of the disability and its characteristics, as expressed in school settings. This improved knowledge will lead to a more compassionate and inclusive classroom environment. This three-minute web video uses cartoon animation, sound, and color to capture children’s attention, yet still offers accurate autism information using language they can understand. It is a great way to start a lesson about autism and accepting differences. The “What’s up with Nick?” booklet and lesson is a colorful, kid-friendly booklet that focuses on a boy with autism named Nick. It teaches children that students with autism may think differently or need some accommodations, but all students are of equal worth and should be treated as such. Each kit contains 20 booklets. Use this small classroom poster to facilitate a discussion at the end of the storytelling. The Kit for Kids online activity workbooks expand upon the information presented in the “What’s Up with Nick?” story and give students a chance to engage with the material they just learned in the lesson. There are different workbooks for students in grades K-1, 2-3, 4-5, and 6-8. They can be assigned as independent or group classwork, or as homework. Autism Tuned In is an online e-learning environment that uses animated videos and activities to expand upon the Kit for Kids lesson. 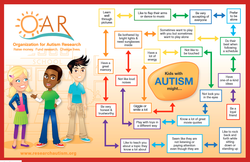 This site not only reinforces knowledge learned about autism, but also addresses topics that are important for every child to explore: being different, understanding others, expressing oneself, and using one’s senses. The flexibility of Autism Tuned In allows us to add depth to the learning experience and make Nick’s story more accessible to students! Pencil prizes and ribbon awards for students that complete the online activities can be ordered free of charge here.